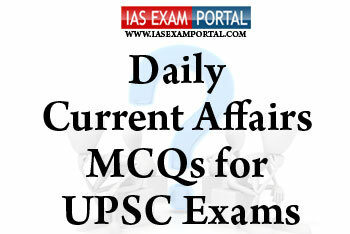 Current Affairs MCQ for UPSC Exams - 08 FEBRUARY 2019 | IAS EXAM PORTAL - India's Largest Community for UPSC Exam Aspirants. 1) India ranks first among the world’s milk producing nations, achieving an annual production of 176.35 million tonnes during 2017-18 with an annual growth rate of 6.62%. 2) The National Action Plan (NAP) for Dairy Development envisages increasing milk production to 254.5 Million MT by 2021-22 requiring an annual growth rate of 8.56%. 3) Even though milk production in the country has increased the per capita availability of milk has reached a level of only 295 grams per day during 2017-18, which is less than the world average of 375 grams per day. Which of the above statements are true ? Q2. Which of the following subjects were included in the concurrent list from the state lists by the 42nd amendment act of 1976 ? Q3. Which of the following statements regarding the recently launched GSAT-31 satellite are true ? 1) The satellite which will a be used for bulk data transfer for a host of emerging telecommunication applications was lifted off from Abdul Kalam island off the coast off Odisha. 2) GSAT-31 has a unique configuration of providing flexible frequency segments and flexible coverage. The satellite will provide communication services to Indian mainland and islands. 3) GSAT-31 will provide DTH Television Services, connectivity to VSATs for ATM, Stock-exchange, Digital Satellite News Gathering (DSNG) and e-governance applications. Q4. Which of the following statements with respect to PM KaushalVikasYojana are nottrue ? 1) (PMKVY) 2016-20 is being implemented with an objective to provide skilling to one crore people under Short Term Training (STT), Recognition of Prior Learning (RPL) and Special Project (SP) across the country. 2) The scheme is being implemented by State Skill Development Missions of the respective States/ UT’s. 3) PMKVY 2016-20 does not mandate the establishment of skill development centres, also the accreditation and affiliation of training centres are being done under single window IT application known as SMART. Q5. The Kartarpur Corridor is a proposed border corridor between the neighbouring nations of India and Pakistan, connecting the Sikh shrines of Dera Baba Nanak Sahib (located in Punjab, India) and GurdwaraDarbar Sahib Kartarpur (in Punjab, Pakistan). Which of the following tributaries of the river Indus passes nearest to the shrine ?